I like to surround myself with little treasures. It may not be the best habit, accumulating things, but it does make me happy to look around me and see things I love. I have decided to share some of my favorite things with you through my blog. I hope you enjoy them too! 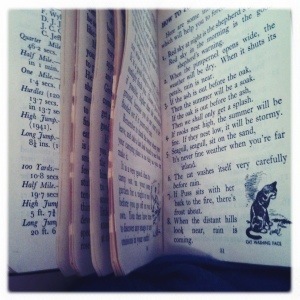 I am starting with a recent find: an Enid Blyton diary for 1949. 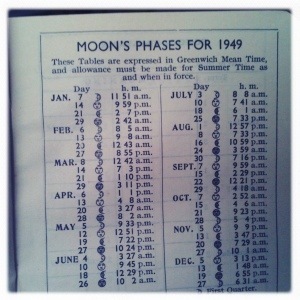 Not only is there space to write for each day of the year and common things like a list of holidays, this diary also contains Poisonous Berries and Plants, Moon Phases and much more! 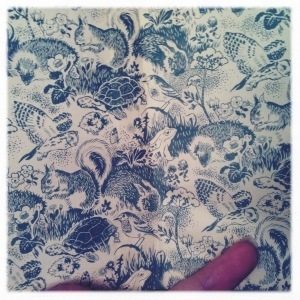 My favorite part may just be the endpapers though, I want to wallpaper everything with it! In addition to the very charming book, there was a letter (from a boy!) folded up inside the book. now for I have one of those G.I. back to your nest or come back to Seattle. 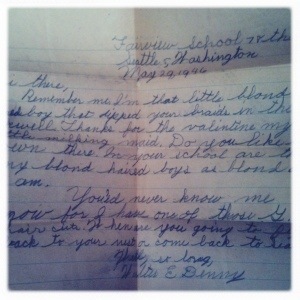 And from what I could find, Walter was 10 when he wrote this cheeky little letter. I really want to know more of the story! 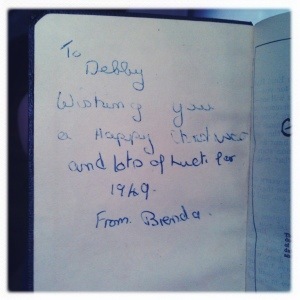 How did a Diary printed in England, find its way to Seattle to end up as a gift to Debby with a letter from Walter tucked in the back. The letter came first, in 1946 and must have been treasured, or perhaps never sent? I may never know, but I plan to continue researching. 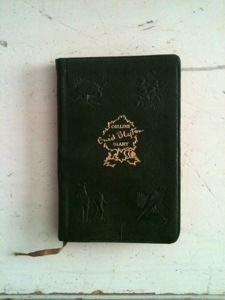 Excellent, I love old diary’s and journals. The letter is very sweet, bless him. Really does make you want to know what happened. …oh also agreed re the end papers, aren’t they lush?! It’s like a mystery! Where is Poirot when you need him? 🙂 I can see the end paper’s decorating something in Lily’s room, maybe in a paler color, so cute. That’s a great find. Most of her illustrated books are out of print now, & her art is so precious. I agree Sue, her art is what I really like. I plan to read some of her books, but haven’t yet. Apparently, there is some controversy over some of her books and new editions of them have been edited to exclude some of the slightly sexist and racist passages. v. interesting!